Villa Terca is located in southeastern Istria, in a beautiful countryside unique for its rolling hills and olive groves. The villa guarantees a beautiful vacation for 8+2 guests, which will have an unforgettable time during their stay in this lovely Croatian region. This family villa is surrounded by a carefully tended garten with an inviting private pool and sun loungers where you can spend your vacation enjoying the warm Istrian sun. For those who prefer spending time in the shade, next to the pool there is also a lovely covered terrace with a barbecue and an outdoor eating area. The terrace can be entered from the garden or directly from the living room thanks to a large glass door, that lets in a lot of natural light during the day. All of the bedrooms in this minimalist villa are air-conditioned, and the villa also provides you with a private sauna for maximal relaxation. 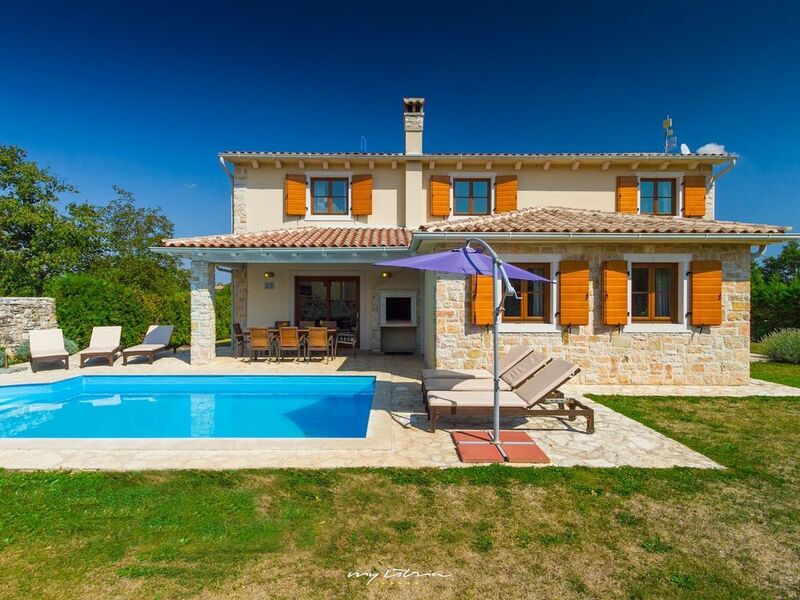 Beautiful Villa Terca is located in a small village near Barban, just a short drive from Pula. Barban is a mediaeval village known for agriculture, stock breeding, woods and its annual ancient cavalry game “The Race of the Ring”. Pula is a city with rich cultural heritage, well known for its Roman Amphitheatre. Only a couple kilometres from the Villa Terca there is an adrenalin park and a ranch where you can experience horseback riding! This peaceful countryside is perfect for relaxing holiday and yet well known touristic places (Pula, Rovinj) and beaches are easy to reach.